For Rory’s 4th birthday yesterday, his present from us was a brand new bedroom fit for a ‘big boy’. 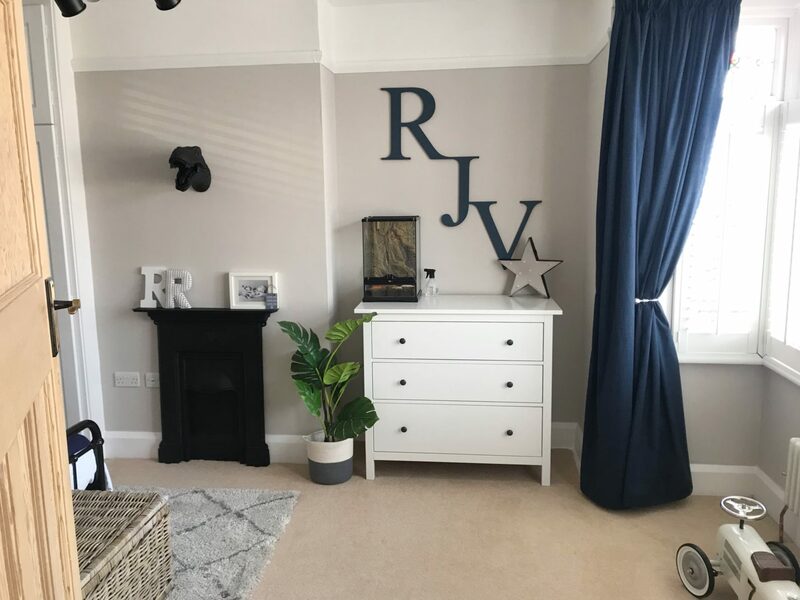 The room was last done 3 years ago for his 1st birthday & we went with a generic neutral look with many of the items from Great Little Trading Co who’s grey & white stars were perfect for him but now felt a bit babyish & I wanted something that was a bit more ‘him’. 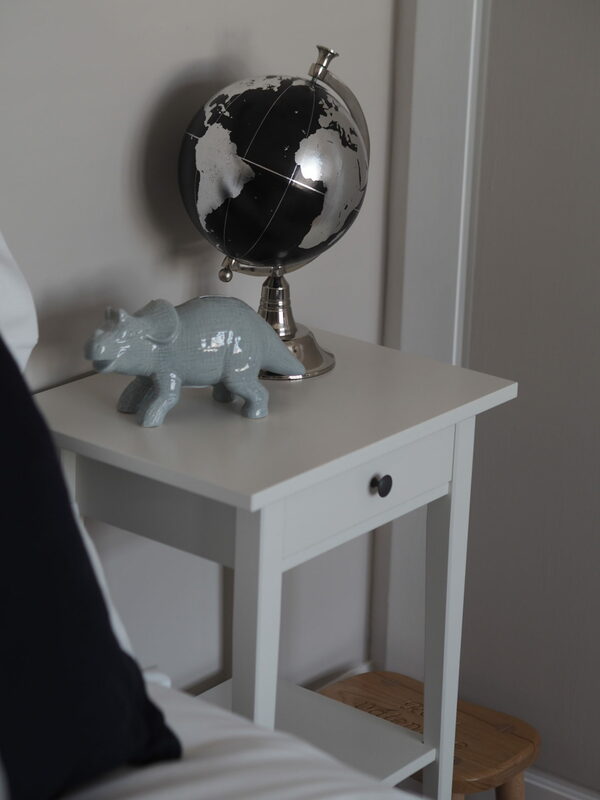 I gave it a little update with some mustard accessories & he moved from his cot in to an Ikea Hemnes day bed but apart from that it’s stayed pretty much the same since then. You can see what it looked like before here. As with any room I design, I wanted to keep the basics & investment pieces like the furniture fairly neutral. It’s much easier to change accessories than it is to have to buy a new bed or sofa once you’ve fallen out of love with it! 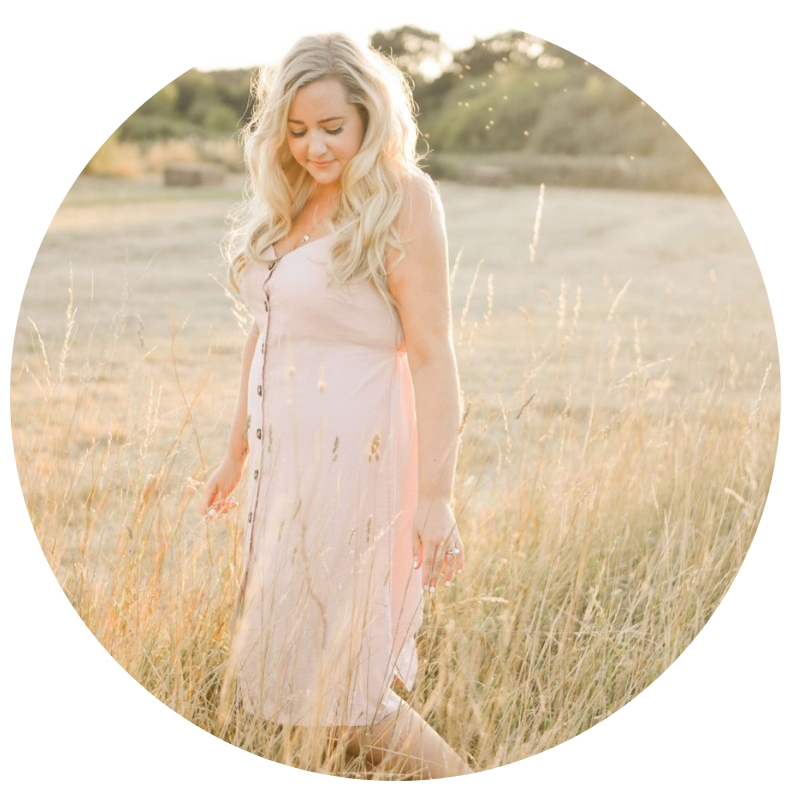 Plus with children, they change & grow so quickly that what they love aged 4 will be very different aged 8 so this was super important when sourcing. 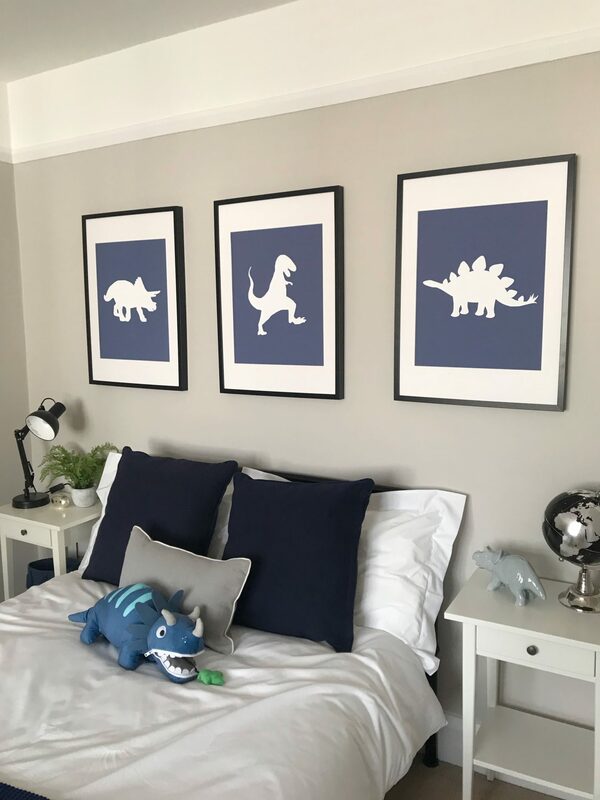 I wanted to add character in to it & Rory is absolutely obsessed with all things dinosaurs so decided to make that my theme although do it so that when the time comes they can be swapped easily. 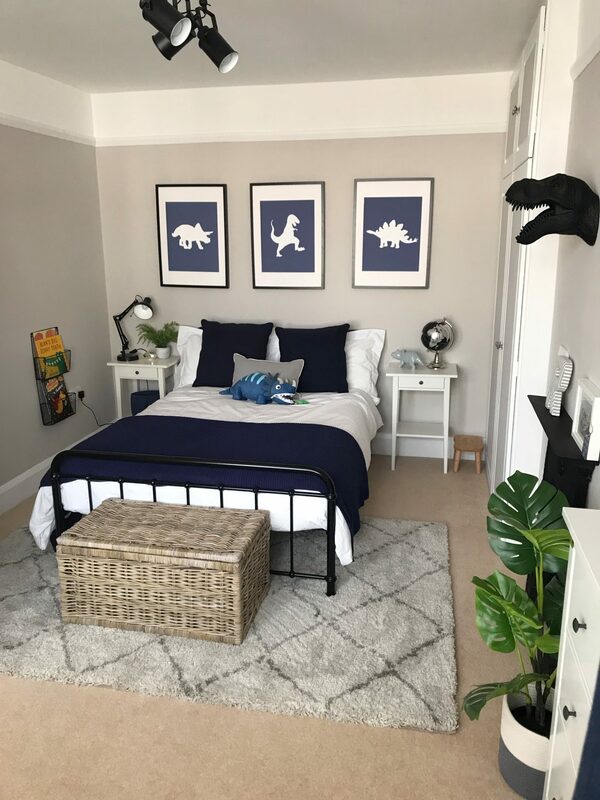 This was done with three large posters which I commissioned @alicesaccessories to make for me – I had the design idea in my head so pretty much told her what I wanted & colour matched F&B Stiffkey blue for the background to tie in the rest then smaller accessories such as the bargain dinosaur head I found & painted from Asda. 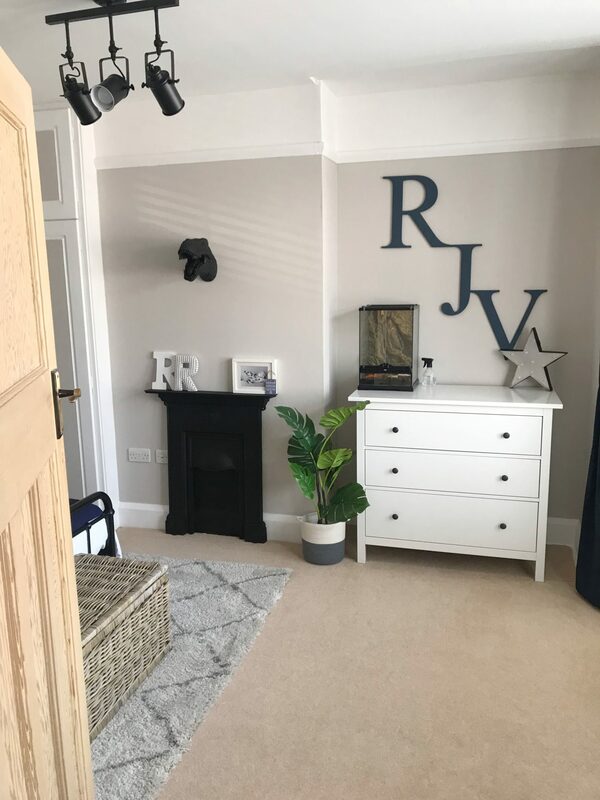 The walls were kept simple & neutral using my favourite grey paint, Farrow & Ball ‘Cornforth White’ mixed up by the Decorating Centre Online which is also across the hallway in Elsa’s room so tie the two together nicely. It’s a warmer tone so it doesn’t make it seem cold or have any underlying blue hues although can look different depending on the lighting. In the alcove that once housed the armchair was that was used for night feeds opposite the door, I’ve popped an Ikea Hemnes chest of 3 drawers. 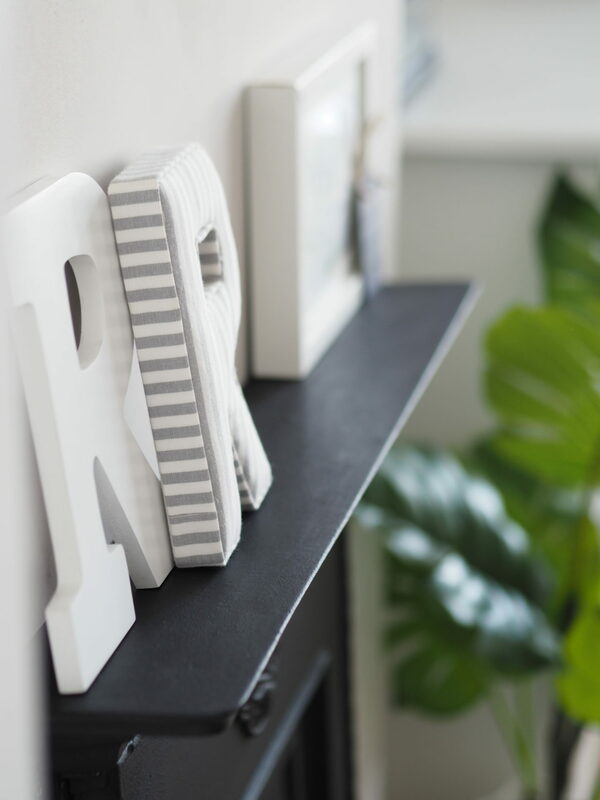 Above are the RJV letters which have been my statement piece since before he was born (& been multiple different colours!) which are now painted in F&B Stiffkey blue. Instead of being hung as before, vertical & symmetrical, they’ve been placed joining each other & sloping down, as voted by you guys on stories. On top of the chest of drawers is one of Rory’s birthday presents, his very own pet snail. Not just any old snail but a giant african land snail….this guy is a baby & will grow to be pretty big eventually. Rory’s affectionately called him ‘Bingo Snigel Valentine’. 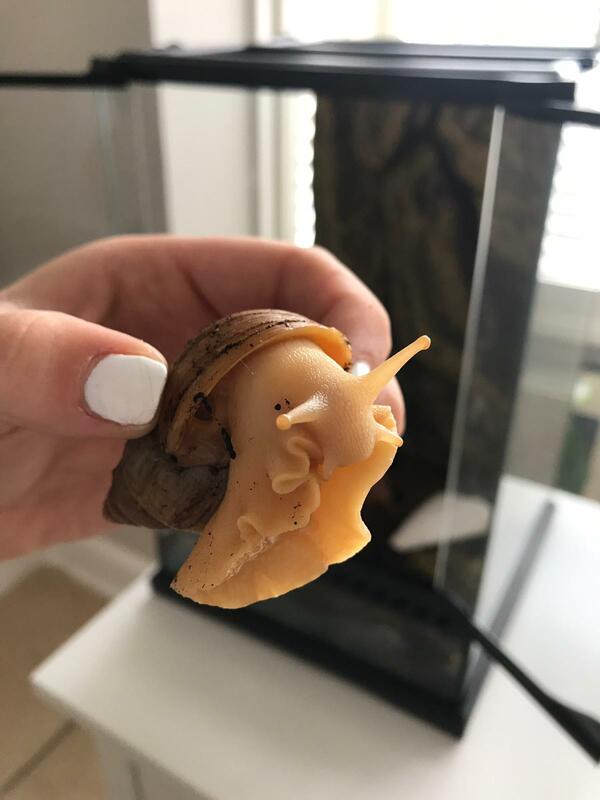 Really easy to look after & what little boy doesn’t love snails….we’ve jazzed up the tank by adding in some plastic dino’s which he thinks are also his pets! I’ve never been much of a fan of sill length curtains & think floor length looks a lot nicer, especially to elongate the room & make ceiling heights look taller. 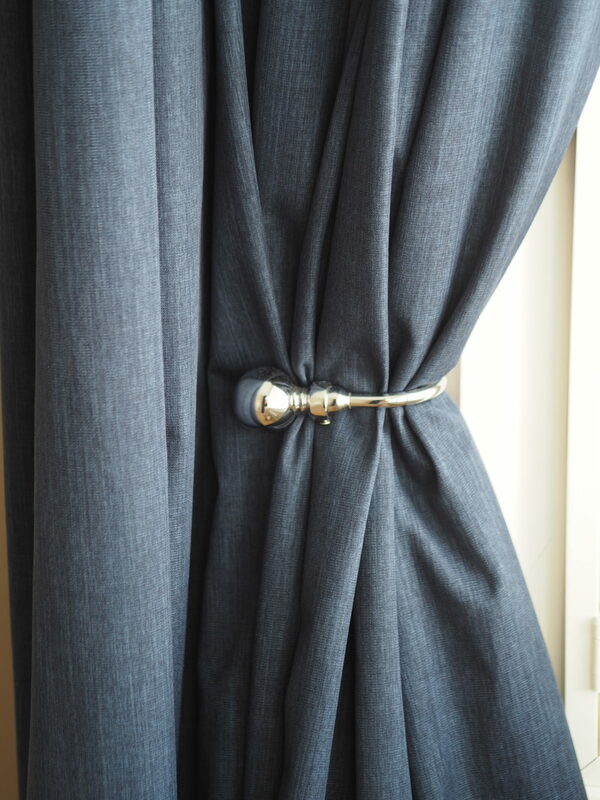 The bay window is 4m so we had to double up (4 curtains sewn together), these are from Dunelm & are the Solar navy blackout pencil pleat in 228 x 274cm. 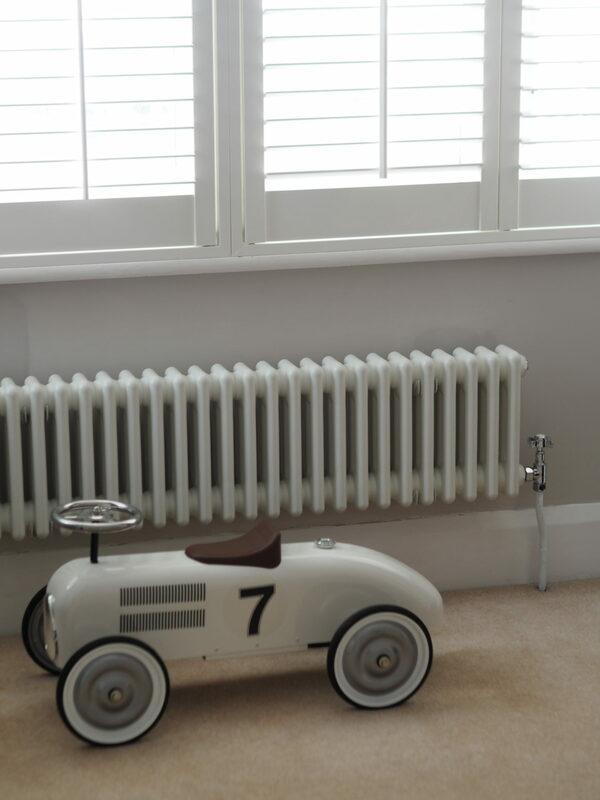 We’ve been on a mission to change the radiators throughout the house to the more traditional column rads – I can’t get over how beautiful they are & what a difference they make to the look/feel of a room compared to the standard ones. Seeing as we were redecorating we decided we might as well get these changed & went for the Milano Windsor from Best Heating. 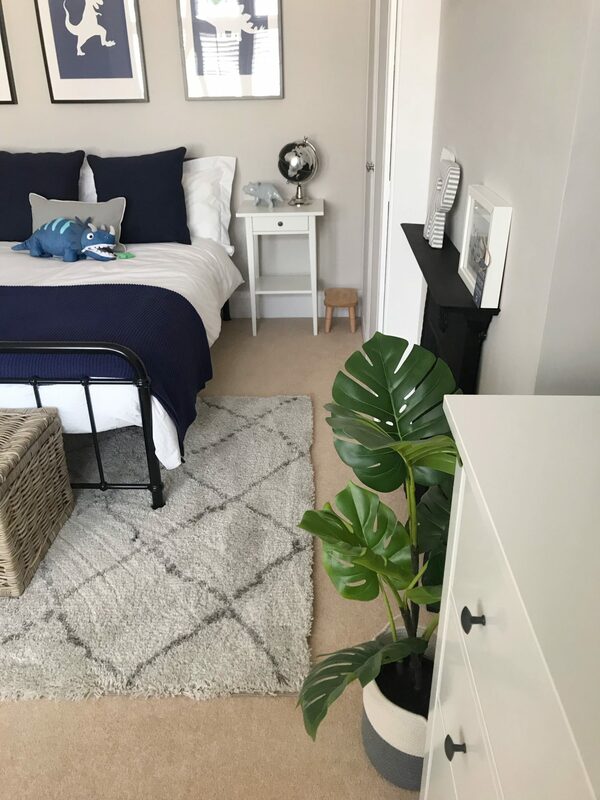 The main thing I wasn’t keen on with the old bedroom was how all the furniture seemed to be shoved in to one corner & the rest was wasted/unused space. The new layout & a double bed makes such a difference & turns it in to a proper room with even more storage space but enough room to play. I found this gorgeous Time Living black Miami double bed frame in Dunelm & I basically designed most of the room around it. 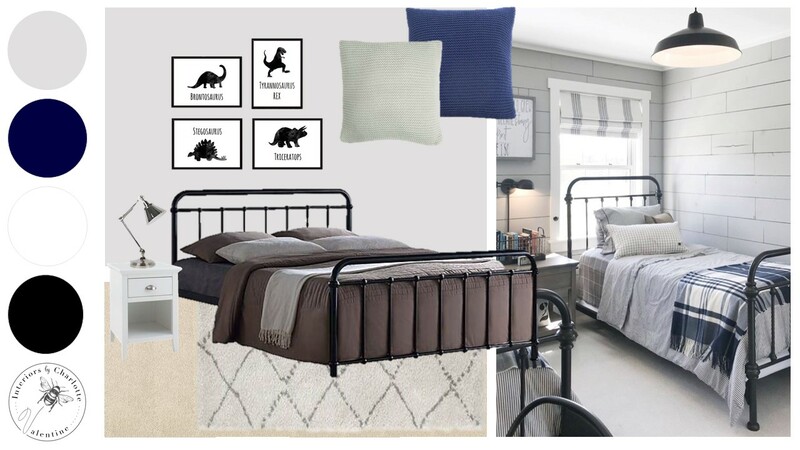 I love how it looks quite industrial but also traditional with the ‘hospital bed’ curved head/footboards. The bedding is all Dunelm too as part of their non iron plain dye collection plus the navy chunky knitted throw & cushions. 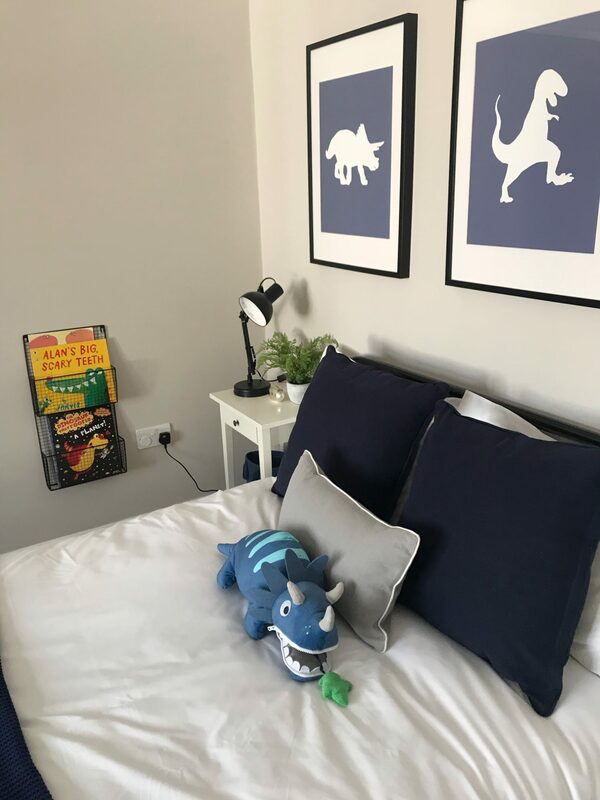 Rory loved this super cute stegosaurus cushion with zip mouth. 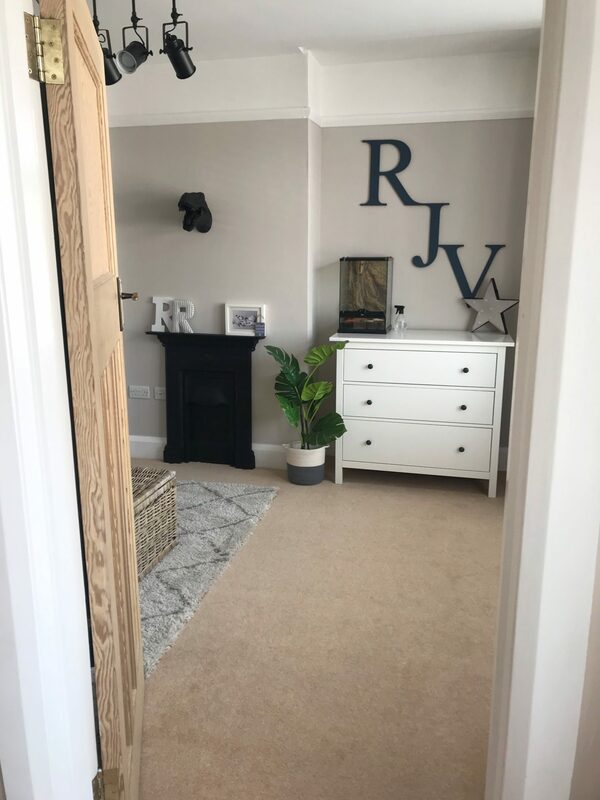 To anchor the furniture & add a bit of pattern (plus the carpet isn’t great in there…) I placed this cream royal nomadic rug in size 160 x 230cm which was £99 & super soft. 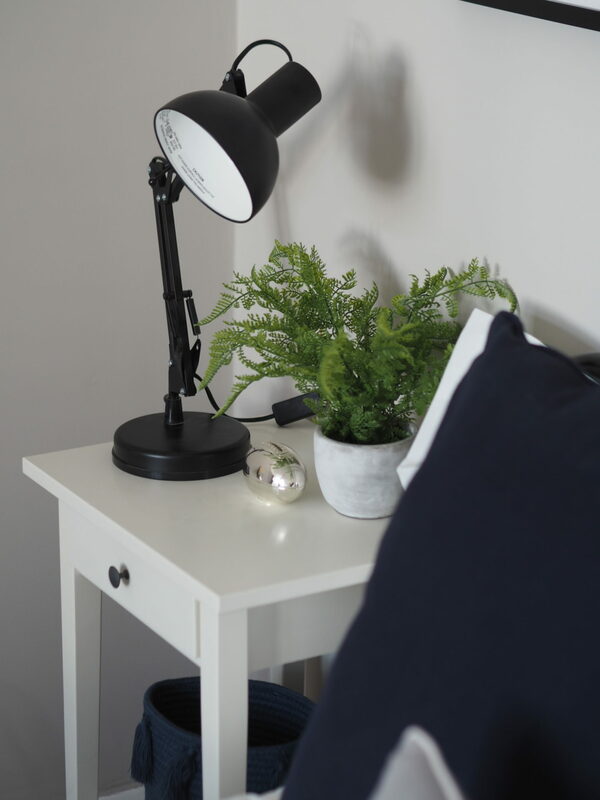 Either side is Ikea Hemnes bedside tables with this bargain black desk lamp (which fits beautifully with the spotlight ceiling light), an artificial fern in a cement pot, a globe from Homesense which I picked up for £6 in the clearance section & then this dinosaur piggy bank. Underneath I’ve popped this navy tassel storage basket from Next, although I can’t find it online, which is perfect for popping little cars & bits in. I’m going to get another for the other side too. 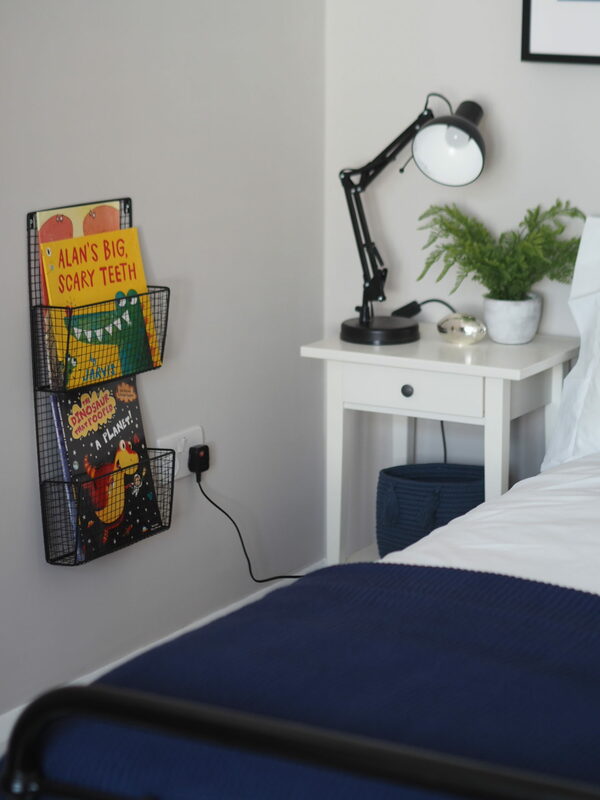 The metal book storage on the wall was found on Ebay which also raises money for the Sue Ryder charity. They have shelves & a few other options too! 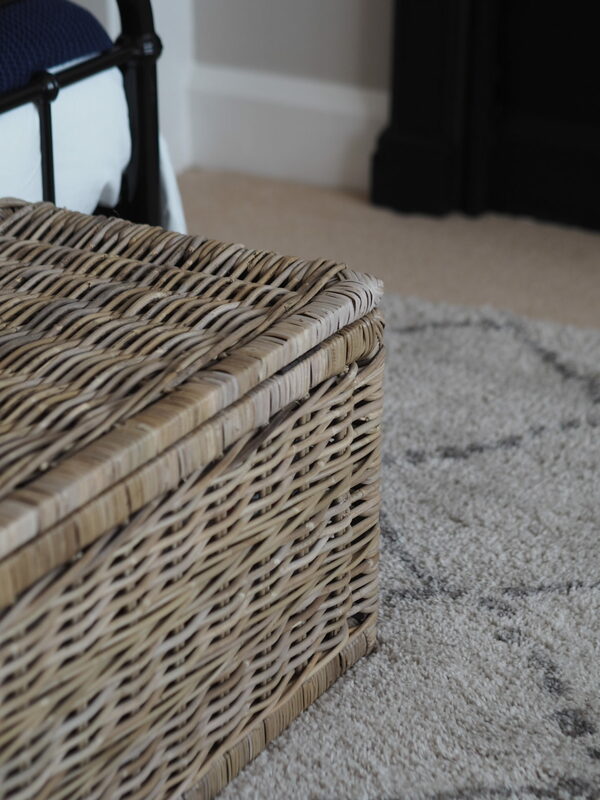 For storage of the bigger toys, at the end of the bed I got this wicker trunk from The Basket Company which is just up the road from me & are the loveliest people. You all know how much I love a wicker basket & these guys have the biggest selection. This is the medium here. 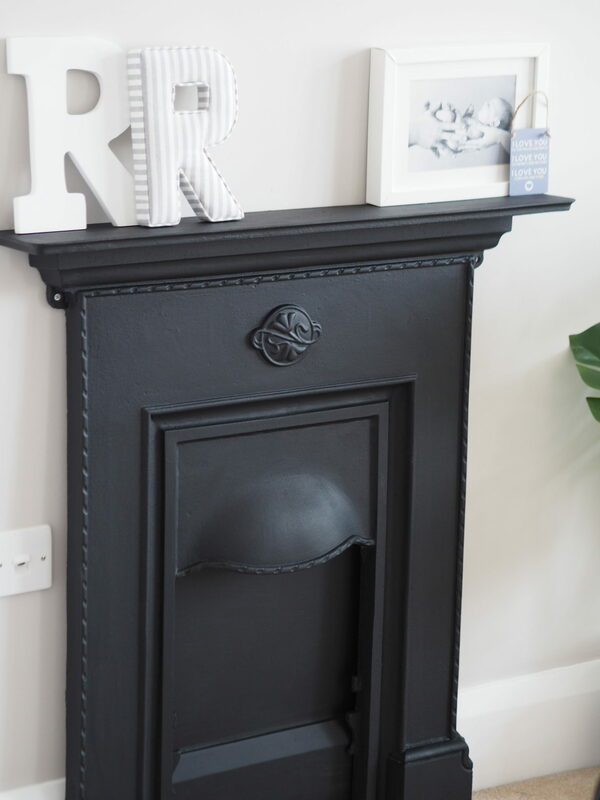 The built in wardrobe was painted from grey & chalk board paint to white & grey with silver handles to merge it in with the walls slightly. The wall which used to have the star print wallpaper on was painted with the rest of the walls but really lacked something. 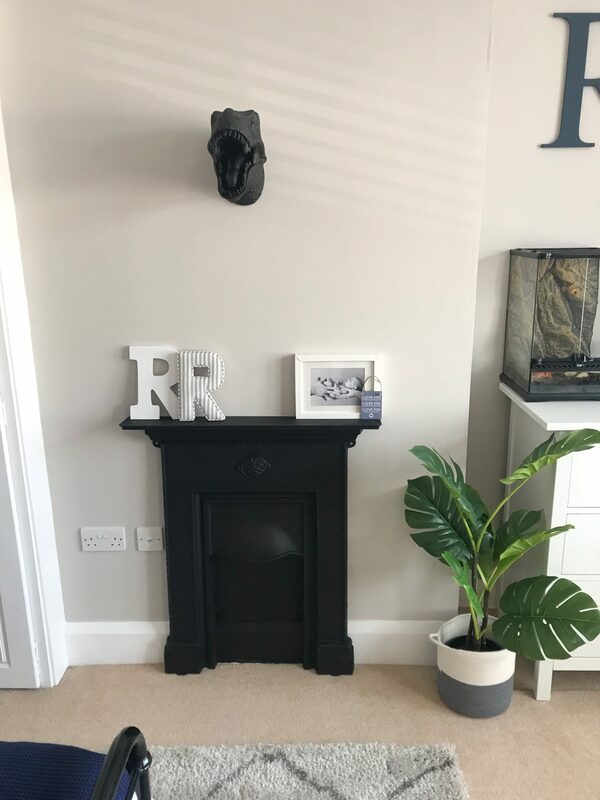 I managed to find a reclaimed victorian fireplace on Gumtree which fit beautifully & adds a bit of character to the chimney breast, this room would have had something similar originally. 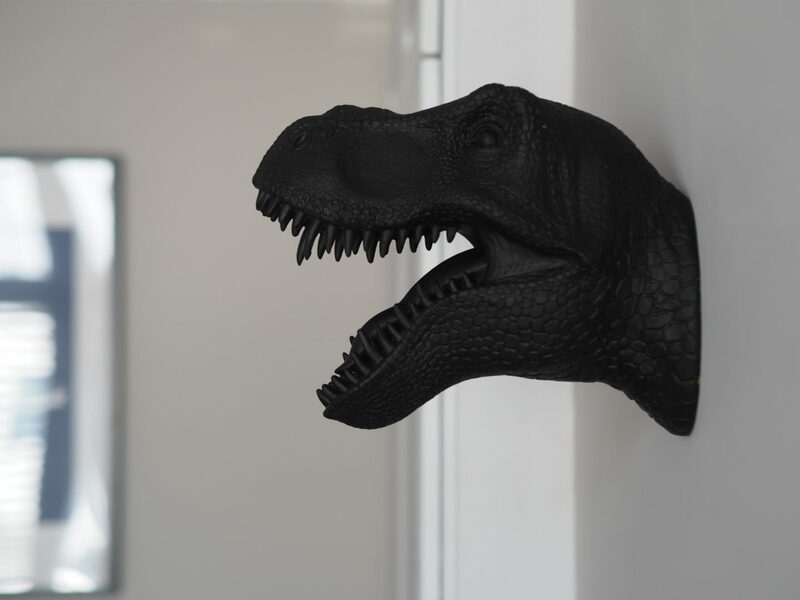 I gave it a lick of paint & hung the dinosaur head above. 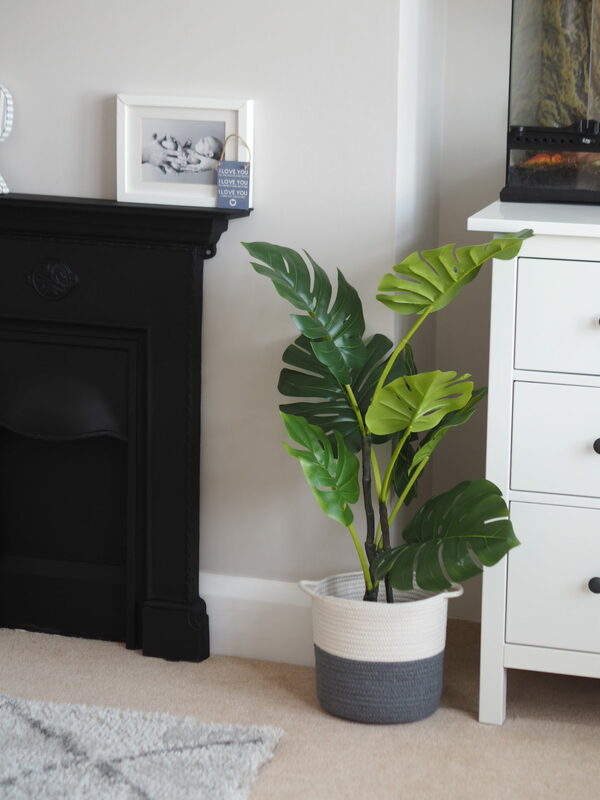 The artificial plant was Ikea & rope basket was a set of 2 I picked up from Waitrose a few months back in the clearance section (& didn’t have a use for up until now!). 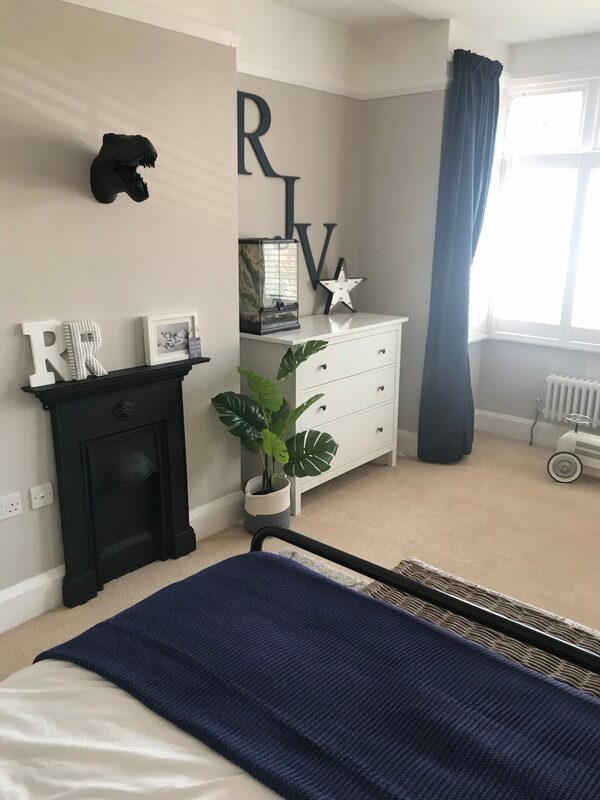 It’s safe to say that Rory absolutely LOVED his new bedroom & said it was the “best birthday ever”. It’s a room he can grow in to & will suit him for years to come. 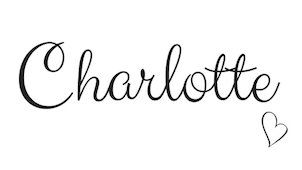 *Some of the items in this reveal have kindly been gifted. This was not a paid collaboration but for full disclosure, I received the bed, rug, curtains & bedding from Dunelm as well as the radiator from Best Heating & trunk from The Basket Company. As always, I would never promote anything I wouldn’t purchase myself & work on an open policy which you can read more about here. Found it to be a little bland really. Not worth the hype. 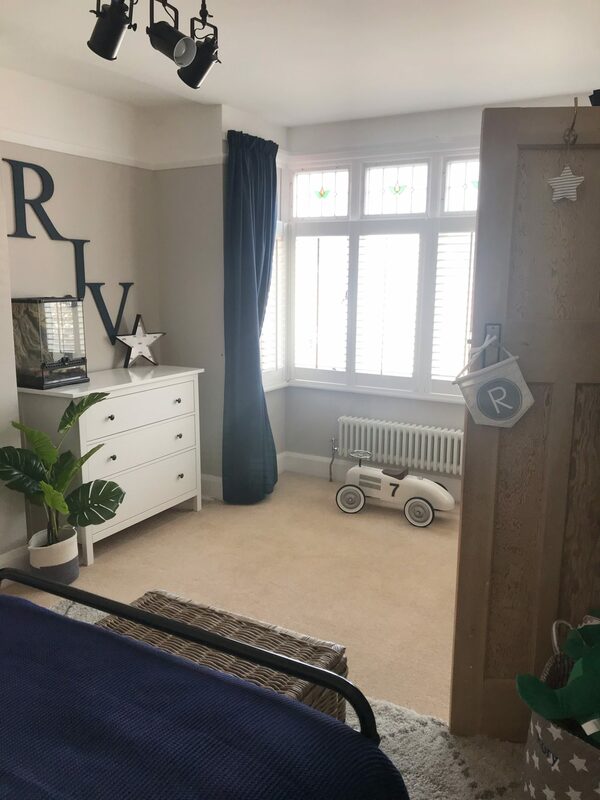 Charlotte what a lovely calm room for a little boy, but will also see him into later years. You’ve worked so hard I hope your really pleased with it too. What a beautiful bedroom, it’s every boy’s little dream. 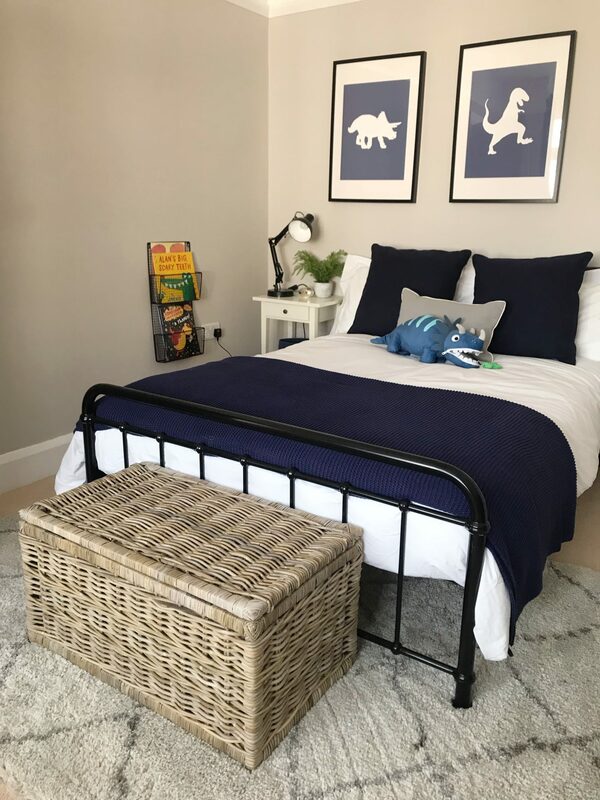 You’ve done such a wonderful job Charlotte – it just looks amazing and Rory looked so proud to have such a lovely bedroom. 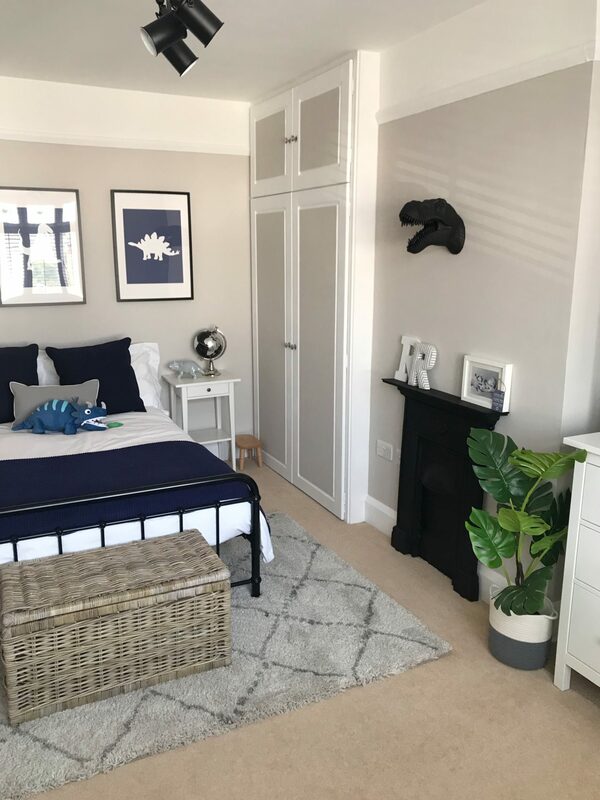 I loved watching the journey of this transformation and I hope every time you look at that stunning room you smile with admiration at what you have achieved. 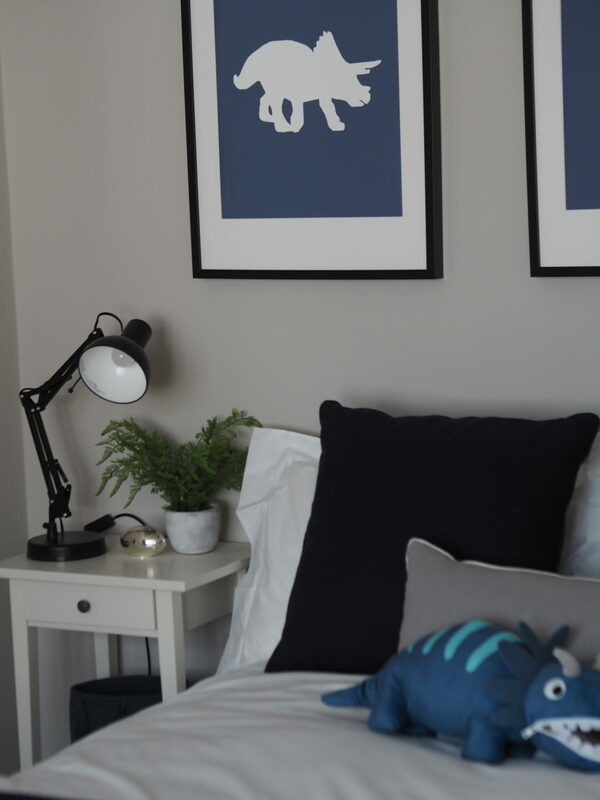 What a beautiful bedroom, it’s every little boys’ dream. 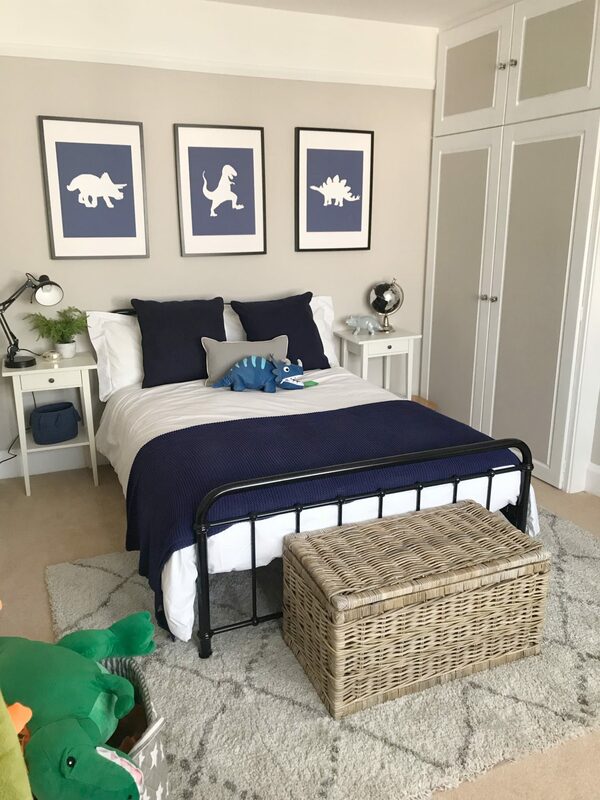 You’ve done such a wonderful job Charlotte – it just looks amazing and Rory looked so proud to have such a lovely bedroom.